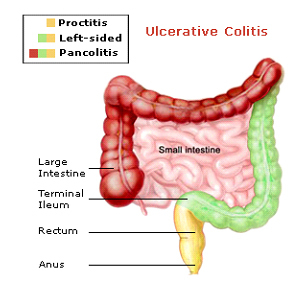 Ulcerative Colitis (UC) is a type of inflammatory bowel disease (IBD). It is a chronic disease of the large intestine, also known as the colon, in which the lining of the colon becomes inflamed and develops tiny open sores, or ulcers. The combination of inflammation and ulceration can cause abdominal discomfort and diarrhoea, often with blood or mucous. Australia has one of the highest rates of UC in the world, but the reason for this is not known. 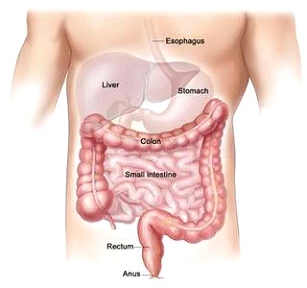 Ulcerative Colitis is the result of an abnormal response by your body’s immune system. Normally, the cells and proteins that make up the immune system protect you from infection. In people with Ulcerative Colitis, however, the immune system mistakes food, bacteria, and other materials in the intestine for foreign or invading substances. When this happens, the body sends white blood cells into the lining of the intestines, where they produce chronic inflammation and ulceration. Although considerable progress has been made in UC research, investigators do not yet know what causes this disease. Studies indicate that the inflammation in UC involves a complex interaction of factors: the genes the person has inherited, the immune system, and something in the environment. Foreign substances (antigens) in the environment may be the direct cause of the inflammation, or they may stimulate the body’s defenses to produce an inflammation that continues without control. As a result, inflammation damages the intestine and causes the symptoms of UC. Dysbiosis or imbalance of the bacteria in the gut has been implicated in numerous conditions affecting human health, including UC, and is of enormous interest to clinicians and patients. Changes in the structure and function of the gut bacteria have been associated with UC with numerous studies illustrating specific bacterial changes in patients with UC. However a causal link has not clearly been established. Occasionally Ulcerative Colitis can be very severe with frequent bloody diarrhoea (more than 6 times per day), abdominal pain and even fever when this occurs it is called acute severe Ulcerative Colitis. Prompt referral to a gastroenterologist with experience in managing Ulcerative Colitis or admission to hospital is required immediately. Bloods tests such as the measurement of white cells, platelets and inflammation (CrP – or “C reactive Protein”), although useful in the assessment of severity in established Ulcerative Colitis, are not sufficiently accurate to be used for diagnosis. Currently there is no role for the use of genetic or antibody testing for the diagnosis of ulcerative colitis. Although useful in some cases X-ray testing (medical imaging) is often not required at regular intervals for patients with ulcerative colitis. If a patient is unwell with a flare of UC a plain X-Ray or CT scan of the abdomen may be performed to ensure that a complication has not occurred, such as dilatation or perforation of the bowel. Colonoscopy is an important and powerful tool in reaching an accurate diagnosis. It is often the best test for making the diagnosis of Ulcerative Colitis. During colonoscopy, your Gastroenterologist is able to document how widespread UC is (the extent of disease); to assess the the severity (mild, moderate or severe); and if the bowel has healed completely (remission). During this procedure, your doctor will usually obtain tiny samples of affected tissue, called biopsies. Biopsied tissues are then analysed by pathologists to determine the presence and severity of UC and also to detect if cancerous cells are present. The colonoscope is a thin flexible tube that allows the Gastroenterologist to visualise the internal surface of the bowel directly. At the tip of the colonoscope, it is equipped with light source, a tiny camera and a channel to obtain biopsies (tissue sampling). With the latest advances in endoscopic systems and image processing power, the clarity and detail of the images obtained is amazing. The Gastroenterologist is able to see inflammation, mucous, bleeding and absence of normal blood vessel patterns. Incidental polyps or benign growths can be found, but a special type of polyps called “pseudo-polyps” can also be present. These are small masses of scar tissue that develop from granulation tissue during the healing phase in repeated cycle of ulcerations / inflammation. Pseudo-polyps themselves are thought not to be pre-cancerous growths, but the presence of pseudo-polyps often signifies long history of active disease. 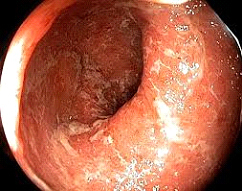 Patients with pseudo-polyps may require regular Colonoscopy on regular basis for polyps that have malignant potential. “Surveillance colonoscopy” is a term a used to denote a Colonoscopy which is performed to test for the presence of bowel cancer. Patients with Ulcerative colitis may have a slightly increased risk of bowel cancer over their lifetime compared to healthy patients who do not have ulcerative colitis. Surveillance colonoscopy is important in these patients to check the bowel for cancerous cells. 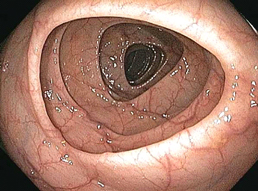 How often surveillance colonoscopy is required is different for each patient and depends on the extent and severity of your UC, whether or not you have had cancerous cells or pre-cancerous cells detected in the bowel before and whether or not there is a family history of bowel cancer. Your doctor will discuss with you how often surveillance colonoscopy is required. For further information, please call our receptionist team on (Rosebud Endoscopy). At GASTROMEDICINE & ENDOSCOPY, Dr. Lani Prideaux, Dr. Emily Wright and Dr. Bei Ye have done, and continue to be involved in, extensive research in Inflammatory Bowel Disease, including Ulcerative Colitis. For further information, please call our reception team on 5973 4444 (Mornington), 9548 5555 (Springvale) and 5986 4444 (Rosebud).